Vietnam’s center is Hue. This historical capital of Vietnam has now many universities, producing many distinguished figures in arts and sciences. Hue is also designated as the World Heritage by the UNESCO. It has the Citadel of Nguyen Dynasty, comparable to the Forbidden City in China. Hue, surrounded by the suburban ricefield, is a city in the nature, with the water of Huong river flowing slowly to Pacific Ocean..
SongCam hotel (Hotel Peaceful Birds)is the newest hotel in Hue which opens in 2007. Located near the riverside and Le Loi street, it is ten minutes’s walk from the Hue railroad station and Quoc Hoc, the famous national high school to which many of Vietnam’s national leaders attended. You can walk to the traditional music tour on the Huong river or visit the relics of the Vietnamese Emperors. Designed to meet the needs of both business and sightseeing, SongCam hotel with 34 air-conditioned rooms is equipped with modern facilities, including internet. There are also a few VIP rooms. The hotel has a tourist office and bath massage rooms, On its top is a restaurant with 300 seats, where you can enjoy the view, eating Vietnamese or Western foods. 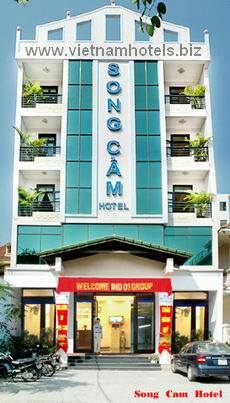 SongCam hotel invites you to visit the old history of Vietnam. SongCam hotel is looking forward to serving you. Hotel pick-up service: US$ 17/way from the airport or US$ 8,- from train station. Meeting rooms: 200 seat meeting room equipped with modern audio-visual technology, hosting conferences, seminars, wedding & parties. Location: 9th floor. - A 200 seat restaurant and sky Bar serving varieties of local specialties, European – Asian food, snack and beverage.